Brad Wiggins’ performance earlier this week in the first stage of the Tour of Romandie was a rare treat for the modern cycling fan: a real Grand Tour contender duking it and taking the win in a bunch sprint. If you’re a retro-grouch, you’ll call it the death of panache, and if you’re a techno-geek, you’ll chalk it up to modern training and equipment allowing cyclists to become more specialized. While a few modern GC contenders—Danilo DiLuca and Alejandro Valverde come to mind—have managed to regularly produce a mean finishing kick, unless El Imbatido can show me something different this summer, I’m inclined to say that both their stints as Grand Tour riders were more triumphs of biochemistry than multi-disciplinary focus. But I’m guessing the main driver for the decline in overlapping ability is economic. When salaries were low and riders needed off-season jobs, they didn’t really get to train year-round. They came into the season on little or no fitness, and those with the most natural ability ended up winning in a fairly wide variety of finishes. With season-long sponsor pressure to perform dulling the razor’s edge of fitness, a rider’s ability just to perform through an endless barrage of race efforts outstripped the importance of fine-tuning a natural inclination toward sprinting or climbing for a few weeks in mid-July. With today’s sponsors bankrolling year-round training and massive on- and off-course support, the single-digit percentages that separate the specialist from the rouleur have become minutes on the hills and bike-lengths at the line. As training became targeted toward peaks at Grand Tours or a handful of one-day events, entire teams coalesced around the specific abilities of a given rider. Mario Cipollini’s Saeco team perfected the sprint train, Armstrong and US Postal perfected the comprehensive approach to winning Grand Tours, and nowadays, there’s precious little ground between them—though one does hope today’s GC winners are somewhat less “comprehensive” in their preparation than Armstrong. i was delighted to see Wiggo take a sprint. hes a real all-rounder. I just remembered another great sprint from a british gc rider. Appreciate the shout out for GC rider sprint wins (+1 for hinault) but I wouldn’t classify LA in 2004 in that category – that was pre cancer when he was a one-day rider not a GC rider. Still a gutsy win but let’s put it in the right category. That was a neat win, wasn’t it? 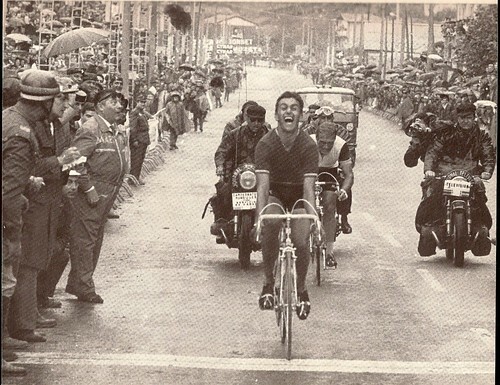 I’m trying to remember other post-Merckx GC riders who pulled this same trick: getting on the front really early and putting in such a huge turn of speed that the “real” sprinters couldn’t come around. Hinault did it for an entire lap around the Roubaix velodrome once; I feel like Lemond did it too, though perhaps in smaller venues like the Coors. Evans’ Giro stage win in 2010 was also a very long sprint, but it was uphill and not against the specialists. @ otto. a quick wiki search on LA will show you he won his first TDF in 1999. Also (sorry, one more thing) — I can’t help but feel deep down that somehow the hyperspecialization of cycling now is a kind of agreed-upon fiction. TDF riders don’t win Paris-Roubaix because they’ve all been told that they can’t (and don’t want to jeopardize their July plans). But I suspect that if you actually compelled TDF riders to do well in a PR-style event, the results would tell a differnet story. Look at group who contested that wet, atrocious cobbled stage from Wanze to Arenberg in the 2010 Tour: a sprinter-rouleur (Hushovd), a TTer-classics rider (Cancellara), an all-rounder (Evans), and a pure climber (Andy Schleck). That was a stage that every big burly guy in the pack wanted to win, and yet they were bested by Evans and Schleck. At some level, I think, quality will still out. and who could forget Fabian Cancellara winning stage 3 of the 2007 tour in the yellow jersey. not *exactly* the same scenario, but still one of my favorite tour finishes of all time — more of a 1k TT than a field sprint; it’s amazing to watch an entire peloton fail to reel him in. i wonder if contractual obligations have anything to do with it. just like some pros arent allowed to ski or sky dive, maybe wiggo isnt allowed to race PR. or maybe its just the nature of how teams split up victories. also there is some truth in the “cobble specialist” lighter riders just dont ride as smoothly (read: efficiently) as heavier ones over the rough stuff. you cant beat physics. Good question re: Jens. The difference between the skill-sets of light and heavy riders makes intuitive sense, but I’ve never understood why it is that roulers — guys who specialize in driving in long breakaways — don’t translate into pave specialists. I know that Boonen has a certain sprinter’s kick that Jens lacks, but don’t they both have “big engines” in the same sense? You’re Anglophone bias in this article almost made me puke Cosmo. Woops, that should be your instead of you’re. @Cosmic osmo you are so right. Of course I was thinking 1994 not 2004. Doh!! 2004 Giro Stage 2 with Cunego. 2005 Tour Stage 21 with Vino. Early 90’s whole bunch of Bugno wins. Laurent Jalaber – Vuelta Winner, and sprinter.